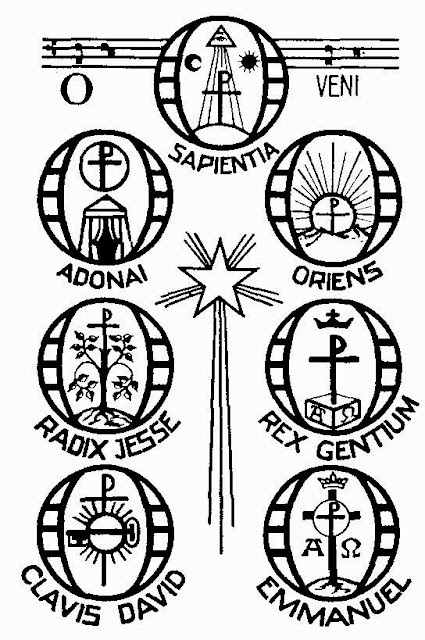 The Feminine Gift: ReGift: The Great and Mighty "O Antiphons"
ReGift: The Great and Mighty "O Antiphons"
Come and lead the prisoners from the prison house, those who dwell in darkness and the shadow of death. If you take the first letter of each antiphon (after the 'O') from the bottom up, you get 'Ero Cras', which means 'Tomorrow, I will come’ in Latin. I love the rich symbolism of each antiphon. I love the intensity of the buildup to Christmas that still allows us to ponder the attributes of Him who is coming. And I especially love how the intensity of the liturgical season mirrors the intensity of the real-life preparations going on right now. There is a reason we're all frantically cooking, cleaning, buying, thinking and preparing. We're like a "Martha" right now; busily making everything perfect and set for the Lord's coming. The O Antiphons help us not to forget "Mary" in the meantime and spend time pondering the Christ Child's presence. It's only in the past few years that I've really come to appreciate the O Antiphons, thnaks to a friend of mine. Love the corelation between Mary and Martha.